The fear mongering surrounding the phony war on terror has continued in a big way. The corporate media recently hyped reports of a supposed terror plot involving explosive devices in packages coming from Yemen. There are so many problems with this story that it is hard to know where to begin in breaking everything down. What is certain however, is that this entire situation is a staged fiasco by the U.S. government and other western powers to further this false terror war and implement more draconian police state measures around the world. Original reports regarding this incident indicate that none of the said suspicious packages contained explosive materials. Despite this, U.S. President Barack Obama contradicted these reports in a press conference this afternoon claiming that two packages from Yemen destined for Jewish organizations in Chicago did in fact contain explosive material. Obama would also direct agencies within the government to take additional measures to thwart any additional supposed terror plots. The two specific packages which Obama referenced were spotted at airports in the UK and the United Arab Emirates. The initial reports of these suspicious packages also prompted searches of planes at Newark, N.J and Philadelphia as well as searches of UPS trucks. No explosive devices were found as a result of the searches on either the planes or the UPS trucks. Obama would go on to say that they believed the two aforementioned packages were sent by Al-Qaeda in the Arabian Peninsula. Following Obama's press conference, many in the corporate media simply forgot about the initial reports and just began to repeat what Obama said. 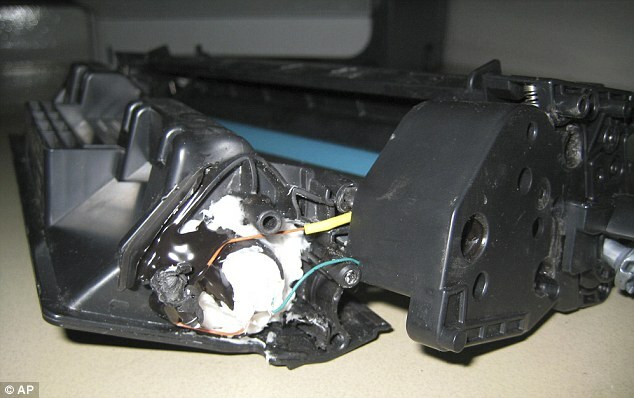 The suspicious package found in the UK was nothing more than a printer toner cartridge with wires and powder. The suspicious package found in the United Arab Emirates contained similar components. CBS News in their report on this situation stated that it was not clear if the device found in the United Arab Emirates was even capable of producing an explosion. In fact, a picture of one of these devices published by CBS News indicates very clearly that it is highly unlikely this device could have done any sort of damage. Despite this, it has not stopped the Obama administration or the corporate media in trying to sell this as a legitimate terror plot. It also has not stopped the UK Home Office from making claims that this device could have been used to blow up a plane. Highly doubtful considering the initial reports and the photographic evidence released by the media. Additionally, neither the Obama administration or the UK Home Office have stated exactly how this device could have blown up the plane. It is all fear based propaganda mixed with deception and half truths. The government and the corporate media now wants you to be afraid of printer toner catridges. Does the above photo really look like a bomb? Additional photos of the so-called ink cartridge device found in the United Arab Emirates can be seen here. As you will see it is laughable to believe that this could have been used as a bomb. How the Obama administration originally learned of these suspicious packages is a mystery in of itself. Supposedly they received some sort of tip from a source within the Saudi Arabian government which is a very bizarre explanation. The lack of a definitive explanation for how they learned of this supposed terror plot leads to many questions as to the credibility of the official story. The entire thing seems completely staged. Of course this whole so called terror plot is being blamed on an organization that the U.S. government calls Al-Qaeda in the Arabian Peninsula. They claim the organization is being lead by Anwar al-Awlaki an individual who is said to be tied to three very suspicious events including the May 2010 Times Square car bombing attempt, the 2009 Christmas Day underwear bombing incident and the 2009 Fort Hood shooting. Although the establishment claims that al-Awlaki is one of the world's most dangerous terrorists, it is curious to see mainstream media reports that surfaced before this supposed ink cartridge terror plot stating al-Awlaki actually attended a luncheon at the Pentagon after the 9/11 attacks. This is despite the fact that at that time there was an on-going FBI investigation into al-Awlaki that linked him to some of the 9/11 hi-jackers. Why would an Al-Qaeda terrorist get invited to lunch at the Pentagon if Al-Qaeda was a real enemy? This is just more proof that Al-Qaeda is nothing more than a phony enemy created by the U.S. government. But the three events that al-Awlaki is alleged to be tied to were clearly staged events with many lingering questions. It is alleged that al-Awlaki trained Faisal Shahzad the man who was sentenced to life in prison for his responsibility in the May 2010 Times Square car bombing plot which turned out to nothing more than an over hyped joke. The end result was a smoking car where the supposed bomb wasn't even built with the right type of fertilizer to create a proper explosion. It was also rigged with M88 fireworks which according to the company that makes the products would not have been able to create a proper explosion if used together. The company's President even said that they wouldn't have been able to blow up a watermelon let alone create a large explosion. Shahzad was also linked with the terror group called Jaish-e-Muhammad which raises even more questions about this incident. Many researchers believe Jaish-e-Muhammad is linked directly with the CIA. The 2009 Christmas Day underwear bombing incident involving Umar Farouk Abdulmutallab attempting to light off some sort of device in his pants while on Northwest Airlines Flight 253 from Amsterdam to Detroit is even more suspicious. Despite not having a passport and appropriate documentation to board the plane, eyewitnesses confirmed that a well dressed man helped Abdulmutallab on to the plane. The fact that he would not have been allowed to board the plane if it wasn't for this well dressed man indicates that this was another staged operation. Nobody is allowed to board planes without appropriate papers and documentation in this so called post 9/11 world. It is also said that al-Awlaki trained Abdulmutallab but if that is in fact true, it is interesting how this al-Awlaki trained terrorist got convenient help from somebody who had the power to put him on the plane. This indicates that the people who al-Awlaki work for are the same as the people who put Abdulmutallab on that plane. The Fort Hood shooter Major Nidal Hassan was also linked to al-Awlaki with the two allegedly exchanging e-mails back and forth prior to the shooting incident. This particular incident is extremely bizarre due to the fact that there were reports of multiple shooters and the fact that cell phone footage of the shooting captured by a soldier was ordered to be deleted. Just a short time before the event, Hassan was caught on camera at a store acting very calmly. Would a man who was just about to kill a bunch of people in the name of Islam be behaving in this manner shortly before the event? It seems as if Hassan was identified as a convenient patsy for this staged operation. The Citizens For Legitimate Government have posted a story outlining even more anomalies and problems with the official story of the Fort Hood shooting. But honestly who benefits from an operation like this? Even if you believe Al-Qaeda in the Arabian Peninsula is a real organization which it doesn't appear to be considering its leader has links back to the U.S. government, this operation only benefits the people in power in the United States. It allows them to justify increased military activity in Yemen, it allows them to justify increasing draconian police state and security measures domestically, it allows the Jewish and Israeli interests to look like the victims of Islamic terrorism and it allows the establishment to make their cult of personality leader Obama look strong in the face of a so-called terror attack right before the election. Conveniently the Yemeni government who has been cooperating with the United States have arrested a young female engineering student in connection with the suspicious packages. It is likely that she was either a useful idiot or a patsy in this obviously staged operation. Fear is the primary weapon that the establishment uses to ensure that you do not think rationally about what is going on in the world. This is just another example of this. The odds of any one particular person getting killed by an Islamic terrorist is close to zero. You are more likely to be killed in a car accident or drown in a swimming pool than you are by an Islamic terrorist. There's no reason for us to be afraid, especially considering that the official story surrounding the 9/11 attacks which was used to kick off this false terror war is clearly based off of lies and fraud. The war on terror is just a massive fear based mind control operation that is promoted by government officials and the corporate media to justify a number of agendas that are designed to destroy individual freedom and to wage foreign wars.